Siraj: Tell me, what news you have brought this time? More sad news I presume. Spy: I am afraid my lord is right. Mir Madan has fallen my lord. He fought bravely but…. Siraj: (Visibly sad)How could I ever repay his debt, my dear friend. And Mohan Lal? What happened to him? Spy: He is fighting courageously against the troops, but he needs reinforcement my lord, as soon as possible. Siraj: My loyal servant, I need you to do one more thing for me. Go to Mir Jafar and tell him I asked for him. Spy: But Sire, do you trust his intentions? Siraj: Desperate times, desperate measures. Robert: As we have decided, all of you will not move your army against my troops. You will stand down till I defeat the loyal generals of Nawab. Once we overthrow Siraj everyone will have their shares. Omichand: No Saheb, I am doing the maximum work here and for that I want 3 millions. Not a penny less, else I shall reveal the whole conspiracy to Nawab. Robert: Cool down Omi, what you are asking is too much, but let’s see what can be done. Robert: (In private) don’t worry Mir Jafar, you will be the next Nawab. I’ll make sure of that and you have to take care of Omi. Mir Jafar: I know Saheb, I trust you. So you can trust me too. Robert: (After Mir Jafar left) William, ask Mir Jafar’s son-in-law Mir Kasim to meet me. Mir Jafar: You called for me my lord? Mir Jafar: My lord, WHAT ARE YOU DOING? Siraj: This is my ancestors honor lying next to your feet Mir Jafar. Save it. Save Bengal from this evil East India Company. I beg of you. Take your army and help Mohan lal, my dear friend Mir Madan has already fallen. You are my last hope. Mir Jafar: Do not worry my lord. I shall do everything in my power to stop them. Mir Jafar (In private with his son) Once everything is done, I want you to kill Siraj slowly and painfully. Cut him alive and start cutting his from his legs. Mir Miran: As you wish father. But why do you hate him so much? Mir Jafar: I was humiliated by Nawab Alibardi Khan, his Grandfather, and he thinks I will be loyal to him. Huh what a fool. Anyway did you make arrangements? Your sister Fatima will visit us today, with your Brother-in-law Mir Kasim. 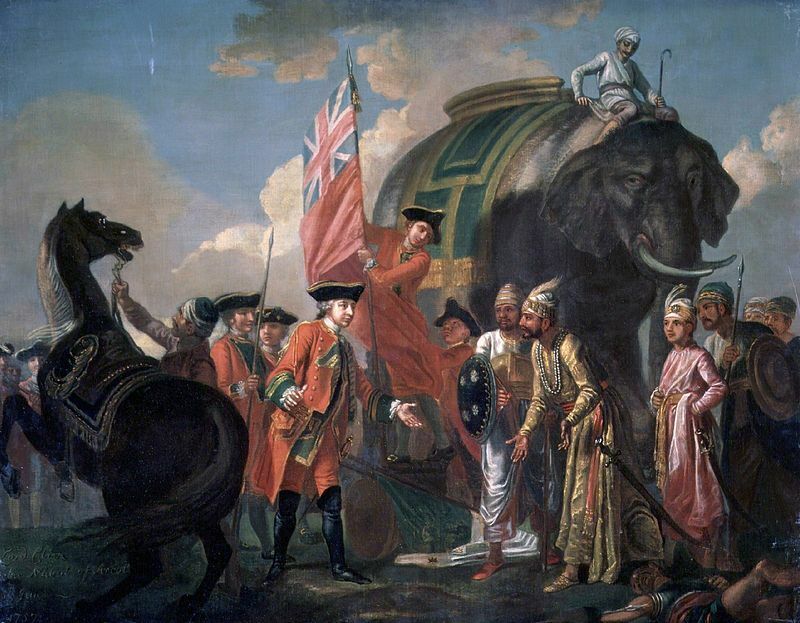 (The last independent Nawab of Bengal Siraj-ud-Daulah lost the battle against the British commander in chief Robert Clive on 1757, famously known as ‘Battle of Plassey’. .Mainly due to the betryal of his subordinates Mir Jafar and his accomplices. He was executed on July 2nd, 1757. This was one of the turning point which helped establishing the company rule in India for next 100 years.